Heat coals or gas grill for direct heat. Place 2 of the tortillas on cookie sheet. Sprinkle each with 1/2 cup of the cheese. Top each with half of the pepperoni. Sprinkle 1/2 cup of remaining cheese over each. Top each with tortilla. Transfer quesadillas to grill 4 to 6 inches from low heat. Cover and grill 2 to 3 minutes, rotating occasionally, until bottom tortilla is golden brown. Turn over with broad pancake turner. Cover and grill 2 to 3 minutes longer or until bottom tortilla is golden brown. Transfer quesadillas back to cookie sheet. Cut each quesadilla into 8 wedges. Serve with pizza sauce. Tip: Flavoured tortillas can also be used in this recipe. Success Hint: These quesadillas can also be cooked on the stove. Heat 12-inch nonstick skillet over medium heat. Assemble one quesadilla in the skillet. Cook 2 to 3 minutes on each side until tortillas are golden brown. Repeat to make second quesadilla. To keep quesadillas warm, place them on an ungreased cookie sheet in a 250 degree oven until ready to serve. 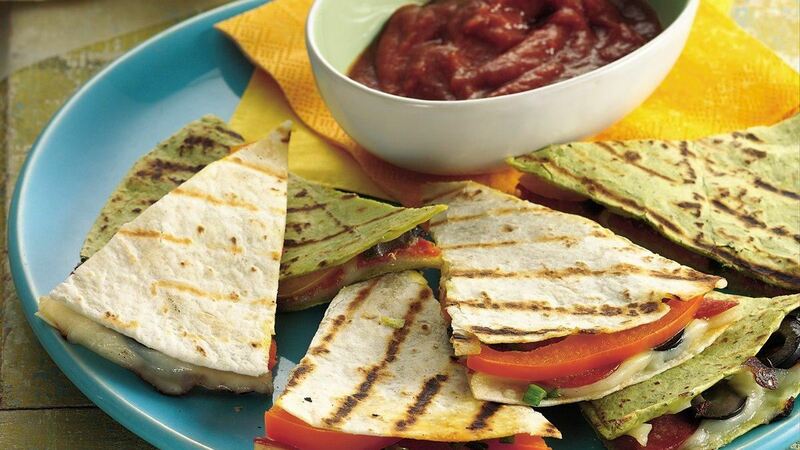 Variation: Any of your favourite pizza toppings can be used on these quesadillas. Add a few sliced red bell peppers, green onions or ripe olives.